Two local martial arts enthusiasts are celebrating their promotion to the coveted rank of Black Belt. 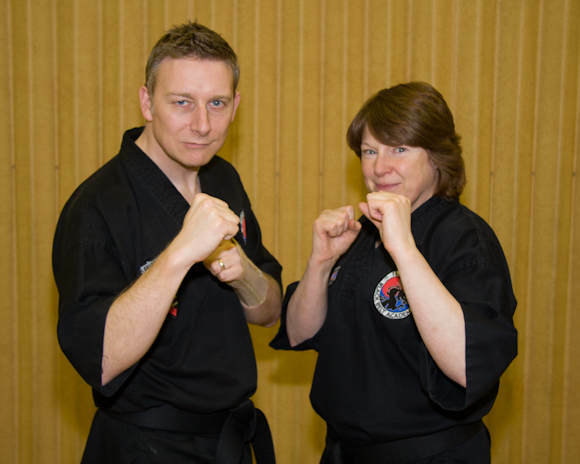 Shirley Williamson from Cam and Stewart Davison from Wotton Under Edge are both members of the Ilyokwan Black Belt Academy which is based at Cam Everlands School, where they train with their instructor Richard Olpin in the Korean art of Taekwondo. Master Olpin said: “Over the years I have been privileged to work with some excellent students, to date we’ve now had 25 black belt promotions in Cam and have five more juniors testing in September this year. Their promotion is based on much more than just one physical exam. They are assessed on many criteria for several months leading up to the final examination. During this time we are looking to see them develop the kind of personal skills and leadership ability that befits someone in a position of respect. They are expected to set an excellent example to others at all times and in this I have to say I am extremely proud of both Mrs Williamson and Mr Davison as they have really raised the bar this time. Similarly, Mr Davison has proven that there’s never any excuse of ‘I don’t have time for exercise’. Stewart has a very high profile and time-consuming job as a manager in the IT industry which involves many long hours and a lot of travel, yet he still manages to fit in his training around work and family life. More than that – he doesn’t just ‘make do’, he really makes the effort to lead by example and provides a tremendous amount of support and encouragement to his fellow students along the way too. Master Olpin said, “Shirley and Stewart have really demonstrated what it takes to be a Black Belt. It’s not just about punching and kicking, it’s about holding yourself to the highest standards and demonstrating the type of character that others can aspire to, whatever you do, both inside and outside the martial arts. In this case they have both set an outstanding example to others and I’m honoured that I get to train with them. I’m really very proud of them both.